Created in 1958, the University Honors Program at Loyola Marymount University seeks to offer an intellectually creative and rigorous academic community for outstanding students. Because the program serves students from all undergraduate majors, across colleges and schools, it is housed outside of individual colleges and schools and instead is overseen through the Office of the Provost. The University Honors Program offers interdisciplinary Core courses and extra-curricular activities designed to create life-long love of learning and the intellectual habits required to serve others. Although academic excellence is the hallmark of the program, the University Honors Program is equally committed to the education of the whole person, the service of faith, and the promotion of justice. Students in the University Honors Program take the Honors Core instead of the general LMU core. Our seminar-style courses are taught by talented faculty members from across the University. Our faculty use innovative teaching strategies to create engaging and academically rigorous learning environments. The University Honors Program also offers co-curricular and extracurricular activities and events that create intellectually stimulating experiences beyond the classroom. A signature of our program is that all Honors students complete independent research or scholarship under a faculty member’s mentorship. 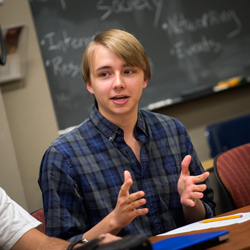 Some students’ projects are funded through competitive grants, through the Honors Program. These grant opportunities allow our students to conduct their research in locations around the world. And almost all of our students present their work, either at LMU’s Undergraduate Research Symposium or at national and international conferences. The University Honors Program is open to students from any school or college of Loyola Marymount University, regardless of major. The Program is administered by the Honors Director, the Honors Associate Director, and the Honors Program Coordinator with the assistance of the Honors Advisory Council. Faculty members of all disciplines are encouraged to be involved with the University Honors Program. Students in the University Honors Program must maintain a 3.50 cumulative GPA and attend a majority of Honors-sponsored events in order to continue in the program. Graduating students receive an Honors medallion to be worn with their academic regalia at Commencement. Admission to the University Honors Program is open to all incoming and current first year students. The program is interested in students who display a sense of academic adventure, high motivation, academic rigor, personal responsibility, social awareness, and the constant pursuit of excellence. Incoming first year students must complete a special University Honors Program application (in addition to their application for admission to Loyola Marymount). Current first year students must schedule an interview with the Honors Director, presenting a writing sample from a class taken at Loyola Marymount and a letter of recommendation from a faculty member. Only a limited number of students who apply will be invited to join the University Honors Program. Application materials are available at http://academics.lmu.edu/honors. Further details on requirements are continued under “University Honors Program ” in the University Bulletin. The Academy of Catholic Thought and Imagination at Loyola Marymount University is a community of scholars who work in dialogue with the Catholic intellectual tradition by developing, critically examining, communicating, or otherwise engaging the rich resources of Catholic thought and imagination, especially as it is informed by Jesuit and Ignatian vision. The Academy serves as a hub for scholarship, interdisciplinary research, innovative pedagogy, and creative outreach across LMU’s campus, in the southwest United States and beyond. Engaging wider local, national, and global communities through lectures, symposia, workshops and collaborative events. ACTI is located on the fourth floor of University Hall, in Suite 4404. For additional information on ACTI services, please call 310.338.7759 or visit the website at http://academics.lmu.edu/acti. The Academic Resource Center (ARC) at Loyola Marymount University provides academic support for all degree-seeking LMU students. It is the mission of the ARC to promote engaged academic citizenship and to provide opportunities for students to become more fully integrated into the rich and diverse culture of the university. Services include content tutoring, university advising, LMU Common Book programs, and the First to Go program. The ARC offers content tutoring for gateway courses in subjects such as chemistry, psychology, and the modern languages, while the undergraduate and graduate tutors in the Writing Center provide one-on-one support for writing assignments in any course. Students who need assistance locating, understanding, and utilizing their academic planning tools may meet with an ARC University Advisor. University Advisors may also assist students with basic support developing productive study habits and time management skills. The ARC provides programing for the LMU Common Book, in collaboration with the Hannon Library; while also providing support for special populations such as first-generation college students through the First to Go program. The ARC is located on the second floor of Daum Hall, and all services are included in the cost of tuition. For additional information on ARC services, please call 310.338.2847 or visit www.lmu.edu/arc. Air Force ROTC at Loyola Marymount University provides an opportunity for students to become commissioned officers in the United States Air Force. The program is typically completed in four years, but there is some flexibility for students to finish the requirements on an accelerated timeline. The program seeks to better develop students in the areas of character, leadership, physical fitness, and academic performance. In addition, AFROTC provides opportunities for scholarships and other financial aid. More information can be found under the “Aerospace Studies ” section of this University Bulletin. The Caloyeras Center for Modern Greek Studies provides students with an opportunity to study the culture of contemporary Greece. Courses are offered in Modern Greek history, the Greek Orthodox tradition and spirituality, Modern Greek literature, language and culture, theater, and film. Every summer the Center organizes the Odyssey Program, a four-week travel and study program in Greece. The program is open to all LMU students. To encourage students and faculty to pursue studies and research projects in Greece. The Center also sponsors and organizes lectures, readings, film screenings, concerts, symposia, and exhibitions on topics of interest to the university and the community at large. The Caloyeras Center for Modern Greek Studies is located in University Hall. For more information, call 310.338.4463 or visit the website at http://bellarmine.lmu.edu/moderngreek. Established as the Center for Pastoral Studies in 1977, the Center for Religion and Spirituality is one of Loyola Marymount’s interdisciplinary centers, and an embodiment of the University’s commitment to serve the Archdiocese of Los Angeles, neighboring dioceses, and religious communities throughout Southern California. The purpose of the Center is to provide educational opportunities for adult learners that strengthen their religious and spiritual formation as ministers, educators, and leaders who are committed to the pursuit of service and justice in their own communities. In collaboration with University faculty, the local Church, and religious leaders, the Center carries out this purpose in three ways: continuing education in theology, religion, and spirituality with an emphasis on pastoral leadership; theological research that is interdisciplinary, intercultural, and interreligious; and outreach to individual parishes, religious institutions, and faith-based organizations. The Center for Religion and Spirituality is located in University Hall, Suite 1840e. For more information please call 310.338.2799 or visit the website at http://extension.lmu.edu/crs. LMU Extension is the continuing education unit of Loyola Marymount University. Utilizing both in-class and online platforms, LMU Extension offers transformative learning opportunities by means of professional certificate programs, coursework and special events in business and nonprofit development, counseling, education, ministry, the arts and humanities, and other fields of study that support the academic and professional goals of nontraditional students and lifelong learners. LMU Extension offers certificates, courses, programs, institutes, conferences, and lectures which provide a variety of educational experiences to members of the community. There are three types of classifications of such offerings. The first of these is Professional Development courses in a certificate or professional development program with identifiable subject areas or in particular disciplines, e.g., teacher education. These are offered under a departmental rubric and carry University semester hours of continuing education/professional development credit. The second type are those courses with academic content falling outside the normal undergraduate or graduate offerings. Such courses and programs are offered under the rubric CNTX. Credit is recorded in semester hours; 1.0 semester hour represents 10 continuing education contact hours. The third type is personal enrichment programs covering a variety of activities that might include dance, martial arts, or yoga, to name but a few. Regular Loyola Marymount undergraduate students may enroll in “For Credit” LMU Extension courses with permission of their College or School Dean, at the fees quoted for such courses, above and beyond regular full-time tuition. Enrollment in other LMU Extension offerings is unrestricted unless otherwise specified, also at the fees quoted. LMU Extension is located in University Hall, Suite 1863. For more information, please call 310.338.1971 or visit the website at http://academics.lmu.edu/extension. The Disability Support Services (DSS) Office provides specialized assistance and resources that enable students with documented physical, perceptual, learning, ADD/ADHD, psychiatric disabilities and students on the autism spectrum to achieve maximum independence while pursuing their educational goals. Services are offered to students who have established documented disabilities under federal and state law. Staff specialists constantly interact with all areas of the University to eliminate physical and attitudinal barriers. Please visit our website for more details: http://www.lmu.edu/dss/ or contact us at 310.338.4216. Please note that all information is confidential. The Individualized Study Program involves a select number of creative and highly motivated students within all colleges and schools of the University whose educational needs and goals cannot fully be met by individual departments or majors. The program is thus designed to offer each participant greater responsibility in determining the content of his or her major program, based upon the goals to which that major is directed. Students may wish to construct their programs or areas of concentration from interdisciplinary, independent study, field work alternatives, or a combination thereof. The program is open to freshmen and sophomores who have completed at least one semester in the participating colleges or school. Once accepted into the program by the Dean of the student’s college or school, the student selects a counselor who assists in designing the specific content of the major in line with the student’s objectives. The student’s program is then formalized into a contract signed by the student, advisor, and Dean. Upon completion of the contracted course of studies, the student is issued a degree in Individualized Studies. The Freshman Orientation Program welcomes new students to the Loyola Marymount community. During Orientation, students are introduced to the academic and co-curricular programs of the University, meet with faculty for individual academic advisement, and are assisted in registering for courses. Students also become familiar with all of the services, activities, and resources available to them. Throughout the Orientation Program, students interact in small groups, led by current LMU students. Since Orientation provides a useful introduction to the people, programs, and opportunities LMU offers. All incoming freshmen are required to participate in the program. For additional information, please contact the Orientation office at 310.338.7429 or orientation@lmu.edu. 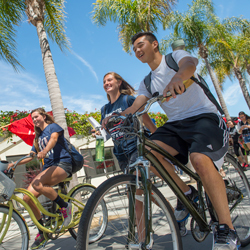 The Transfer Orientation Program is the best way to acclimate to life at LMU. Orientation helps students become familiar with their new campus, learn about student life, and introduce them to current and other new students as well as helpful and friendly faculty and staff. Some of the activities that take place at orientation include: opportunities to meet faculty and discuss questions about the University; introductions to LMU’s wide-ranging events, clubs, and organizations; discussions with current students about various involvement opportunities on campus; and a chance to speak with representatives from all administration areas (Registrar, One Card, Financial Aid, etc.). For additional information regarding Transfer Orientation, please contact the Transfer Programs office at transferprograms@lmu.edu or 310.338.5252. The Loyola Marymount University Postbaccalaureate Premedical Program is for those who received a bachelor’s degree from an accredited four-year institution in an unrelated field, and have completed less than four of the prerequisite courses for admission to medical or dental school. A minimum undergraduate GPA of 3.2 is required to qualify for the program. The ideal candidate will have had sufficient experience in the medical field, either through volunteer work or previous employment, to serve as a basis for an informed, mature, and committed decision to enter the field of medicine or dentistry. The program is designed to prepare students for the challenges of medical and dental school by offering intensive, full-time study in the classroom and in the community over a 13-month period. The program enrollment is set at 14-16 students to give individual attention, support, advising, and resources that meet students’ needs. LMU offers a structured and comprehensive curriculum that gives students the opportunity to prepare for the MCAT or DAT in five terms. To remain in the program, students will need to successfully complete a full-time load (minimum 12 semester hours Fall and Spring semesters, and 6 semester hours in two 6-week Summer sessions) and maintain a minimum of 3.2 term GPA. Individuals interested in applying to this program should check the program website for application materials and timeline: http://cse.lmu.edu/centerforstudentsuccess/healthprofessionsadvising/pre-medicalpost-baccalaureateprogram. For questions about the program, please send an email to pre-health@lmu.edu. The University offers several curricula that are appropriate for students who plan to enter law school upon the completion of their undergraduate degree. The prelaw student should select a course of study that insures the development of the skills essential to the successful study of law: 1) the ability to use language and communicate effectively and 2) the ability to think critically and creatively. In addition, the prelaw curriculum must provide a broad understanding of basic human institutions and values. To insure they follow an appropriate course of study, prelaw students are advised to select their classes in consultation with the University Prelaw Advisor. The Prelaw Advisor also serves as a resource person for students during the law school application process. The Health Professions Information Program provides the student with regular informational meetings. The Director of the Program serves as a resource person and is available for individual consultation. The Director’s Office distributes relevant materials to prospective applicants and maintains their files for the Health Professions Advisory Committee. The Committee assists students in completing the application process to health professional schools. The University offers pre-health professional curricula for those students who plan to apply for admission to the following programs: Medicine, Dentistry, Optometry, Pediatric Medicine, Veterinary Medicine, Pharmacy, Medical Technology, Occupational Therapy, Physical Therapy, and Public Health. 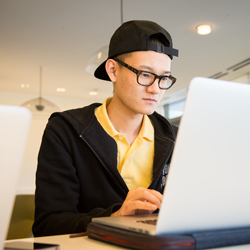 These curricula are not degree programs, and students who wish to complete the requirements for a Bachelor’s degree before admission to a professional school should select a major within the University. 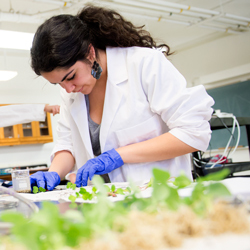 Students usually select a biology, biochemistry, or other science major. Students in other majors should consult with the director early in their college career about blending pre-health profession courses with their chosen major. In addition to fulfilling the requirements of the chosen major, specific requirements of the professional programs should be satisfied. The following lower division courses are usually required: BIOL 101 , BIOL 102 , BIOL 111 , BIOL 112 , BIOL 201 , BIOL 202 ; CHEM 110 , CHEM 111 , CHEM 112 , CHEM 113 , CHEM 220 , CHEM 221 , CHEM 222 , CHEM 223 ; English (6 semester hours); MATH 122 , MATH 123 ; PHYS 253 , PHYS 254 ; and PSYC 1000 . In addition, other specified upper division biology, biochemistry, and statistics courses and electives from Liberal Arts, Fine Arts, and the Sciences may be required. Students should be aware that many health professional schools do not recognize some AP credits and that alternative coursework may need to be completed to meet admission requirements. Please discuss with the Director. Semester programming listed as “featured” indicates federal, state, and institutional aid travels with the student. LMU Semester Study Abroad programs provide unparalleled opportunities to learn in a distinctive setting, experience a new culture and become a global citizen. Spending three to four months abroad is the perfect way to really get to know a new city, a new country, and potentially a new language. Students will study with LMU classmates and learn from LMU faculty and local instructors. LMU semester programs offer a range of core and specialized courses, for which students will earn LMU credit and grades. All courses are taught in English with the exception or foreign language courses. Students apply for the program one semester before they would like to participate, register for courses via PROWL, pay LMU tuition and program fee, and keep their financial aid package including any grants and scholarships already awarded. A comprehensive list of LMU semester programming can be found on the LMU Study Abroad website. Exchange programs allow LMU students to spend a semester studying at carefully selected institutions of higher education around the world. An exchange program is an exceptional opportunity to enhance one’s college experience and become fully immersed in another culture. LMU students live and study with students from the host country. 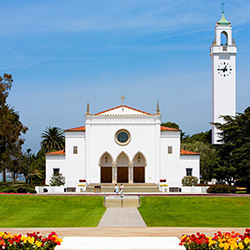 Academically, they will be challenged by learning a new language, if they choose, or exploring an array of unique course offerings that count as transfer credit toward their LMU degree. In order for transfer work to be eligible for LMU credit, a course must be passed with a grade of “C” or higher. Students apply for the program one semester before they would like to participate, pay LMU tuition, and keep their financial package including any grants and scholarships already awarded. Housing and Board costs vary by location and are paid directly to the host institution. At most institutions, LMU students take courses taught in English as well as any applicable foreign language courses. Exchange Programs in Spanish speaking countries require that students have an intermediate level of Spanish, as they will take classes taught in Spanish as well as any available courses taught in English. A comprehensive list of reciprocal exchange programming can be found on the LMU Study Abroad website. Loyola Marymount University highlights other programming offered by other U.S. or international institutions. One such organization is the Association of Jesuit Colleges and Universities, which has a common mission and belief in the development of the whole person and a commitment to social justice, service, and leadership development. The LMU Study Abroad Office offers several AJCU semester study abroad programs, which have been selected to meet LMU standards. In order for transfer work to be eligible for LMU credit, a course must be passed with a grade of “C” or higher. Students apply for the program one semester before they would like to participate, pay LMU tuition and program fee, and keep their financial package including any grants and scholarships already awarded. A comprehensive list of other featured programming can be found on the LMU Study Abroad website. A list of other academically approved programs may be found on the Study Abroad website. If a student chooses to study abroad in one of the approved programs, he or she must follow the administrative procedures below in order to receive prior approval. In order for transfer work to be eligible for LMU credit, a course must be passed with a grade of “C” or higher. Schedule an advising appointment with the Study Abroad Advisor who advises for Non-LMU programs. In addition to the host institution application materials a student must submit directly to the host institution, he or she must complete an LMU Study Abroad Application by the deadline. Students will go through the Study Abroad Transfer of Credit Approval (TCA) process to determine how the courses will transfer towards their degree as part of their LMU Study Abroad Application. Students are strongly encouraged to speak with their departmental advisor about their study abroad plans and discuss how they fit with their academic plan. Students who do not complete the above full administrative procedure starting with the Study Abroad office will not be approved to receive academic credit for their Study Abroad program. LMU Summer Study Abroad programs, typically four to five weeks, provide a rich academic experience complemented by short cultural excursions. Students can take core and specialized courses for which they will receive LMU credit and grades. Each program is led by LMU faculty members whose expertise in the country and subject matter give a lasting perspective of the host country and provide a strong academic foundation. Students apply for the program through the Study Abroad Office, register for courses via PROWL and pay for the program cost via the Student Account Center. A comprehensive list of programming can be found on the LMU Study Abroad website. Non-LMU Summer Study Abroad programs, typically four to five weeks, provide a rich academic experience complemented by short cultural excursions. The LMU study abroad office has selected a small number of non-LMU summer programs to highlight and offer to our students in conjunction with our own programming. In order for transfer work to be eligible for LMU credit, a course must be passed with a grade of “C” or higher. Students apply for the program through the Study Abroad Office and pay for the program cost as indicated on the LMU study abroad website, via the Student Account Center. A comprehensive list of programming can be found on the LMU study abroad website. The Study Abroad Transfer Course approval form is used for all study abroad programming models aside from the full LMU semester or summer programs. The Study Abroad Transfer Course Approval (SATCA) form is part of the application process for study abroad. In order for transfer work to be eligible for LMU credit, a course must be passed with a grade of “C” or higher. Complete a Study Abroad Transfer course approval form listing all courses. If you are taking courses which are part of your academic major program, you must obtain the approval of the Department Chair for each course. Take the approved form to your Dean’s Office for approval and then submit it to the Study Abroad Office for further processing. Courses which have not received prior approval on the SATCA form generally do not earn LMU credit. Students seeking to transfer credit from overseas program experiences that does not follow the full pre-approval process may find that credit is not transferable. All Study Abroad work completed through a sponsoring institution must be documented on an official transcript from a U.S. Institution accredited by one of the six regional associations of the Accrediting Commission for Senior Colleges and Universities. Study Abroad work completed at an international institution must be documented on an official academic record from an institution recognized by the Ministry or Department of Education of that country. Work completed at institutions which do not have official recognition by the Ministry or Department of Education of that country are not eligible for transfer. Order an official transcript from the University attended and have it sent directly to the LMU Office of the Registrar. LMU course credit will not be granted without an official transcript. Students who would like participate in a semester program that is not pre-approved must petition the Study Abroad Office for a one-time program approval. This process must be started at least one year before the study abroad semester. Students wishing to petition for summer programming must submit a similar petition by March 1 in advance of any non-LMU summer program of that same year. Students must demonstrate a compelling academic reason to attend and follow the full administrative procedure starting with the Study Abroad Office. The petition must be pre-approved by the Study Abroad Office, the student’s Associate Dean and the institution accreditation must be verified and approved by the Office of the Registrar. The Study Abroad Office strongly recommends that the full administrative petition process be completed before the student makes any payment to a non-approved program. For more information regarding Study Abroad opportunities, please consult the Study Abroad website (http://www.lmu.edu/studyabroad) or contact the Director of Study Abroad, Adrian Doyle, at Adrian.Doyle@lmu.edu, 310.338.1973. The Thomas and Dorothy Leavey Center for the Study of Los Angeles is one of the leading undergraduate research centers in the nation. It is a respected leader in public opinion surveys, exit polling, and leadership and community studies. Founded in 1996, the Center conducts groundbreaking research through its LA Votes exit poll project, LA Riots Anniversary Studies, and LA Region Public Opinion and Leaders Surveys. It provides rigorous, mentored research experiences for undergraduate students with an emphasis on hands-on field research. The Leavey Center for the Study of Los Angeles is located in University Hall, Suite 4119. For more information, please call 310.338.4565 or visit the website at http://academics.lmu.edu/studyla. 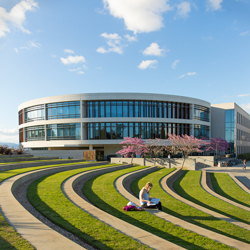 The William H. Hannon Library serves as the cultural and intellectual heart of the LMU Campus. The librarians at the Hannon Library support the academic success of each student and faculty member by providing outstanding information resources, expert research assistance, and access to advanced technology in a beautiful and comfortable setting. Housed in a modern LEED Gold certified building located centrally on campus overlooking the bluff and the city of Los Angeles, LMU librarians offer services and collections both physical and digital to support the learning and research needs of the LMU community 24 hours a day. Information literacy-the ability to identify information needs, locate and access relevant information, and critically evaluate a diverse array of sources-is a key skill embedded throughout all four years of the LMU Core Curriculum. LMU Librarians collaborate closely with faculty to offer expert, customized information literacy instruction to help students develop and hone their research and critical thinking skills in every discipline. In addition to research instruction integrated into the classroom, expert help is available from a librarian in-person at the Information Desk and 24/7 in a variety of formats including chat, email, and phone. Hannon Library’s collections include more than 600,000 ebooks, 570,000+ in print, 67,000+ online journals, and approximately 200 online research databases. The Department of Archives and Special Collections houses rare books, manuscripts, art, and the University Archives. Notable holdings include original works by St. Thomas More, Oliver Goldsmith, and other rare English and American first editions. Other important collections include the papers of the motion picture producer Arthur P. Jacobs, best known for the Planet of the Apes series, and the Werner Von Boltenstern postcard collection, which contains over a million cards. The library also houses the Research Collection of the Thomas and Dorothy Leavey Center for the Study of Los Angeles which collects research materials relating to local public officials, post-World War II developers, late twentieth-century reformers, and prominent Catholic families. The Digital Library Program leads and facilitates digital scholarship and digital humanities on campus. LMU Digital Collections showcases digitized materials from the Department of Archives and Special Collections, contain materials in various formats, and cover a variety of subject areas including the history of Southern California, Catholicism in Los Angeles, and Loyola Marymount University; postcards from around the world; medieval manuscripts and more. Digital Commons at Loyola Marymount University and Loyola Law School, an initiative of the William H. Hannon Library and the William M. Rains Library, serves faculty and institutional interests by collecting, organizing, preserving, and disseminating faculty and student scholarship and creative works in a digital, open-access environment. It also serves as the platform for the publication of the university’s law and other academic journals. The library also contributes to the education of the whole person through a robust and diverse lineup of cultural and intellectual programming and exhibitions. By partnering with a wide range of campus units throughout the academic year, The library offers entertaining and educational author talks, discussions, receptions, installations, and performances designed to highlight our library collections and the research and creative works of our LMU students and faculty.